Welcome to the Artistic Outpost December New Release and Blog Hop! This month, Artistic Outpost is releasing one Christmas background stamp and one Christmas stamp set! You can use these sets on their own or combine them together to create some beautiful Christmas cards! Keep reading below to see how you can win a $15 Gift Code to the ODBD Website! Click here to order Artistic Outpost products from Our Daily Bread Designs Website! Today, I'm sharing two cards using the new AO stamp sets, along with dies and pattern paper from Our Daily Bread Designs. Just for commenting on the Design Team Blog Posts, you have a chance to win a $15 Gift Code to the ODBD Website. You have until December 9, 2016 at 10:00 PM CST to leave comments on the participating designers blogs for a chance to win! One random winner will be selected from the comments left on the designers blogs, the winner will be announced on the AO Blog on December 10, 2016, be sure to check back there to see if you have won! Lisa I love how you showcased this beautiful little girl in both cards. The Gloria set is beautiful! Your Christmas cards are so beautiful! I love the vintage look of the cards. Beautiful cards Lisa. I live the colors and stamp used in the first one. It seems like there are so many ways you can use this stamp set. 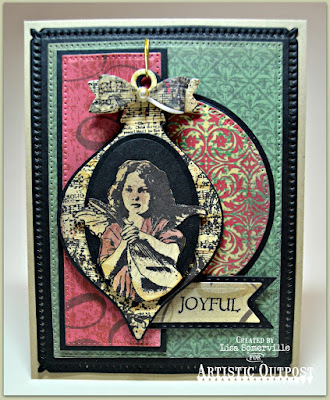 Gorgeous cards Lisa, love how you've used the sweet girl with the Christmastime background. Both cards are beautifully embellished. As always Lisa, your cards and use of papers is gorgeous! 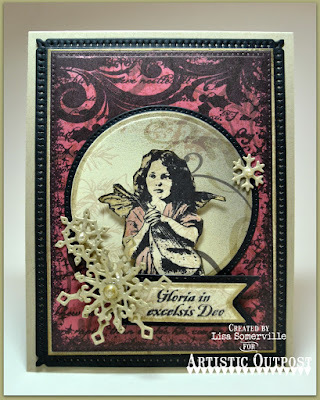 Love the backgrounds and use of dies with Gloria! Awesome vintage Christmas cards! Love them!